Support your customers via SMS with Text, included with Zendesk Talk Team, Professional, and Enterprise plans. 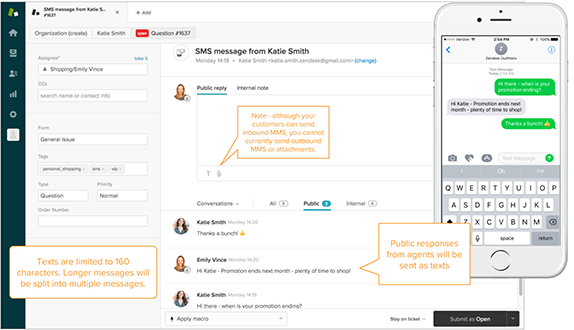 Talk enables you to respond to inbound texts, automate alerts, or send proactive messages. For example, you might send an automated text response when a customer submits a request or alert an agent via text when a ticket needs attention (for examples, see Text recipes). Texts automatically create tickets right in Support, so you can apply all the advantages of automated workflows, centralized reporting and full customer history to text support. There’s no coding or additional software required, so you and your team can get started in minutes. For a list of currently supported countries, and prices for Text, see Text usage pricing. Text messages can be up to the standard 160 character limitation in length. If you type a longer message, it will be split into multiple messages, each 153 characters in length. For example, if you type a message of 161 characters, it will be split into two messages; one of 153 characters, and one of 8 characters. You can send up to 250 simultaneous text messages from the same number. You can receive inbound MMS messages on US local numbers, but Text does not currently support outbound MMS messages. Set up a new Text number under Admin > Channels > Text in Zendesk Support. If you want to add Text to an existing Talk number, see Enabling a Talk number for Text. For detailed steps, see Adding a Text number. Text is a feature of Talk, so selecting a number for Text will initiate your free trial of Zendesk Talk. Trials include one free phone number and a $1 of usage credit. My team has a Talk Team, Professional, or Enterprise account. If you have a Talk Team, Professional, or Enterprise account, you can choose a separate phone number to try Text -- it'll be yours, free, for 30 days (you may be able to use the same number for Text that you use for Talk. Contact our customer service team for more information). If you are currently trialing Talk Team, Professional, or Enterprise, your free $1 credit will apply to Text. If you are a current customer with Talk Team, Professional, or Enterprise, any Text usage fees will be applied to your account. My team has a Talk Lite account. If you are on our Talk Lite plan, you will need to upgrade to our Talk Team, Professional, or Enterprise plan to use Text. To try Text before upgrading your Talk plan, contact our customer service team. My team uses another SMS provider -- can I use that number for Text? If you decide to purchase Text (included on the Talk Team, Professional, or Enterprise plans), you can port over an existing phone number from another provider to use for Text. Learn more here, or contact our customer service team for more information. Now that you’ve started your free Text trial, send a test text from a mobile phone to your new Text trial number. You’ll see that your text will automatically create a ticket in your Zendesk Support account. Public replies in the ticket will send a text back to you. Note: To take advantage of user identification for inbound texts, set the mobile phone number you use for testing as the “direct line” for an end-user profile. Learn more here. Now that you’ve received and responded to an inbound text, take it to the next level and set up an automated outbound text. See detailed steps and more ideas for ways to use triggers and notifications with Text here. Note: Because SMS messages have a 160 character limit, when you send a URL as part of a message, our provider Twilio automatically creates a shortened version of it. While this URL shortening generally works well, it might occasionally cause a problem with message delivery. If you notice your messages are not being delivered, please let us know. When you’ve reached the end of your free 30 day trial or use your $1 free credit, add Team, Professional, or Enterprise to your Zendesk subscription to continue using the Text channel. We would like to use the phone number we have in Voice to also send texts.. is this possible? Can you port your own number for Text? You can do this by going into Admin > Channels > Talk > Numbers > Settings, you can enable the number for text. Is it possible to get new tickets issued after some criteria when being texted from the same phone number? In my tests it appears all texts coming from that phone number are lumped into the same ticket or reopen's solved tickets. I'd like to be able to specify when a new ticket is generated when being texted from that same phone number. I have the same request as @Simon, is it possible to the system create a new ticket for texts? You will need to look at creating a tag/trigger combo that you can use to close off tickets. Basically you will need to create a trigger that marks a ticket as closed, when a particular tag is applied. I've added an example below for you. Your agents will then need to apply the tag manually to the ticket prior to saving when they come to the end of it. Alternatively, you can look at creating a macro which can apply the tag as well. The agent would then just simply need to run the macro before saving the ticket. Doing this effectively marks the ticket as closed. When the end-user sends through a new text about a new issue, it would then create a new ticket. This may not be ultimately ideal in regards to your own workflow. However this is the best workaround currently in light of the lack of separate automatic ticket creation for text conversations. right now messages are coming in bottom of the queue. is it possible to be notified of the texts similar to a chat format? Please make Singapore number available for Text function! It's painful to see the exact function I need but not being able to use it because of the region. That's an interesting question...I'm not sure if that's possible or not. I'm going to see if I can find someone to answer this for you! Right now there is no window for Text like there is for Chat. One thing some of our customers have done is create a view for Text. You can create a View with the condition Ticket:Channel is Text. At least then you have them separated and easier to organize. I hope this suggestion is helpful! Can I send SMS messages to international numbers from a USA number? Welcome to the Community, Esteban! Yes, I believe that you can! You can find a list of estimated prices here. Hi there! 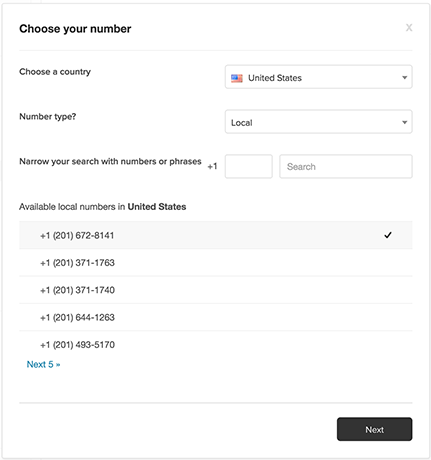 You can find information on how to port your number into Zendesk Talk in this article. You can definitely use a Talk number for Text as well; you can find the information on that in this article. Hi, we need mms for Australian mobile numbers please. Zendesk would be the first platform to do this in Australia, this would be a point of difference. When could we expect to see MMS for Australian mobile numbers? Hi Ruth! Welcome to the Community! According to this article, Indonesia mobile numbers are available! We understand how to make this work, but going through the process of creating a new ticket, adding a tag, triggering the message...just sounds like overkill that will slow down Supporters. I know we discussed this in a ticket but since you've also posted this question publicly I'd like to make sure that other customers can also locate my suggestions. Although a Trigger is needed to send a response via the Text for a ticket that was not created via the Text Channel, it is not necessarily a requirement that the entire example Triggers outlined in Using Text notifications with triggers: Recipes and tips be created. 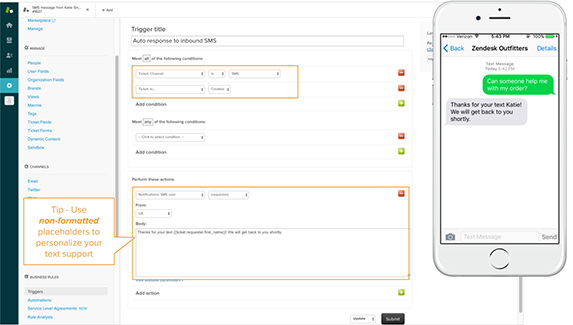 You can use the Trigger action of "Text user" along with other Trigger conditions to define when you want the Text to be sent within a ticket created from other channels (similar to the Alert agents when a ticket needs attention example Trigger from the linked documentation). I asked my account rep several times if we could send outbound texts apart from the automations. Just one at a time outbound. But this article seems to be saying that we cannot initiate a text message even if we have a phone number even though my rep said I could....I feel like they weren't truthful. That was the one thing I was concerned about with zendesk. This is not meant to be a rant....my question is will there ever be an option where we can send out texts inside support one at a time without a macro or automation? Apologies for any confusion here. I can definitely confirm that you can send a proactive outbound text from Zendesk to a customer. We call these Proactive texts in Zendesk. You do need to set up a trigger in order to create the workflow for proactive texts. Once it's set up, you can then send out as many new texts to your customers as you need from there. Please check out the guide here on how you can set up the proactive text workflow. Look for this subtitle "Start a conversation with proactive outbound texts" in the article and follow those steps from there. We'd like to use Text in Australia however it doesn't support MMS on a local number. Are ZD reviewing this ? Currently MMS is only available for US numbers. This is a limitation from our voice provider Twilio at the current stage. We hope that if they offer it in the future for Australian mobile numbers that we will also be able to offer the same to our customers. I just wanted to inquire about the maximum character limit sent via sms for each segment. From my understanding, the first segment could fit up to 160 characters, does it mean that 2 segments could fit up to 320 characters or just 306? If the answer is 306 characters in 2 segments, a 320 character message would be sent in 3 segments (3 sms). Meaning the first two segments would hold 153 characters each, and the last one would hold 14 characters. You are absolutely correct, each message is actually 153 characters in length, so a 320 character message will be three messages. Twilio's docs outline this in this article! Edited to add: if your text is equal to or less than 160 characters, this is treated as one text. However subsequent messages will be processed in 153 character chunks. In the event that you send a text that is 161 characters, the first text will be 153 characters and the second will be 8 characters. Essentially, from 1-160 characters, this is one text. Any texts send over 161 characters will be treated in 153 character chunks. If you send a 1,600 character message, it will be sent as 11 messages of 153 characters, with the last message containing 70 characters. I have sent a request internally to make this a bit clearer in this article, as it is definitely confusing! And the updated article was really of great help! I'll definitely share this with my team. Is there any progress in updating so that a new ticket can be created when being texted from the same phone number? If a ticket is set to Solved or Closed status, a reply from the same phone number will generate a new ticket. If a phone number has an existing ticket and it replies, that response will thread to the existing ticket.